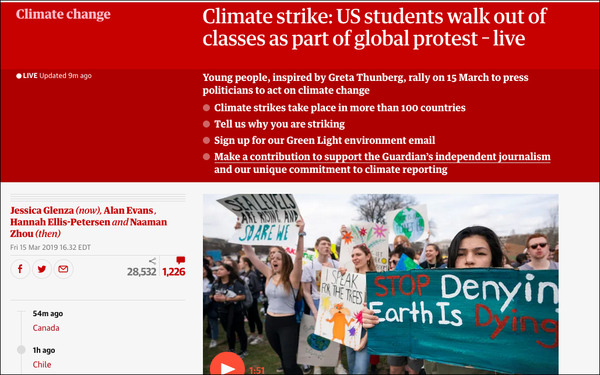 The Guardian US devoted its homepage to climate change for 11 minutes this morning, in support of school climate strikes taking place today around the world to raise awareness about the state of the global climate crisis. The homepage went live from 11 a.m. to 11:11 a.m. EST, with more than 40 stories from Guardian correspondents and columnists, the same 11 minutes students were walking out of schools in the U.S. A rally was held at the U.S. Capitol, and more than 70 events swept across the country. “To raise awareness of the global emergency, the Guardian US dedicated our site to climate change stories for 11 minutes," the site read this afternoon. A recent UN report warned that the world has 11 years to avoid the worst effects of climate change. “Throughout the day, The Guardian will highlight the voices of young people from the US and around the world who have never known a world where the climate isn’t rapidly heating," Jane Spencer, deputy editor of The Guardian US, wrote in a post on The Guardian US. A photo gallery on The Guardian US featured tens of thousands of students striking across the globe, from India to Sweden. “We’re inspired by the new generation of young activists fighting to put climate change at the top of the agenda,” stated Spencer. “In the coming year – and throughout the 2020 election – The Guardian US will amplify the voices of young people to make sure those most threatened by climate change are part of the conversation." Starting at 10 a.m. in Australia, (Thursday 7 p.m. EST in the U.S.), The Guardian will also offer live coverage for 24 hours of the worldwide strikes as they move across the globe. Reports will come from countries like Australia, Thailand, the UK, Belgium, Sweden, France and Spain. Friday’s climate protests are expected to be one of the largest environmental protests in history, with planned events in at least 100 countries. Organizers estimated over 1 million people would take part.